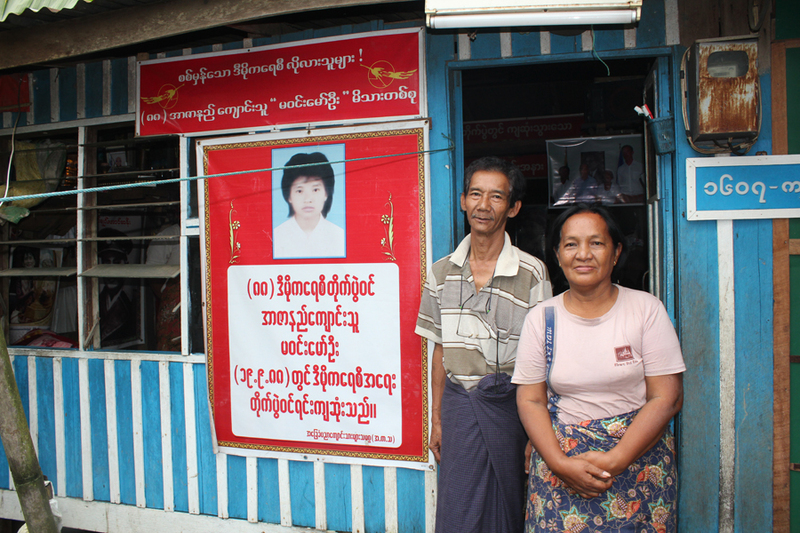 A series of reflections on my most recent trip to Burma. When I travel in Burma, I rarely have a schedule or a firm itinerary. Instead, I try to follow my intuition. On this trip I wanted to go down south to Moulmein (Mawlamyaing), but I had no clue why or what I wanted to do there. I did not know what to expect, I did not know anybody in town. I only knew that it is the fourth largest city in the country with more than one million inhabitants, that it is very hot and humid, and that the British writer George Orwell was once stationed there or nearby. And I liked the name. Moulmein sounded very exotic and romantic to me. There were three ways to get there: I could rent a car, take a bus, or the train. A rented car and a driver was by far the fastest and most expensive. The bus the cheapest, and would take 8 to 10 hours. 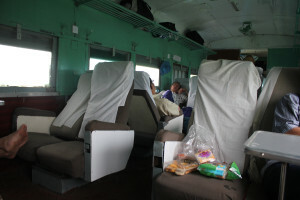 The train did not make any sense: it was more expensive than the bus, but less comfortable and slower. The trip would take 12 to 14 hours. 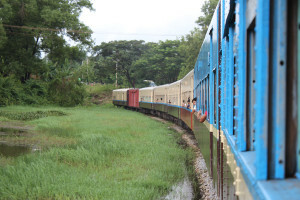 I love train rides in Burma. They are a reminder of an age when time did not matter so much. When efficiency was not a paramount concern. When getting from A to Z was a real effort. A friend of mine and I booked two seats in the Upper Class. It is not much different from the Ordinary Class, except for the reclining seats that did not recline and the fans that did not work. 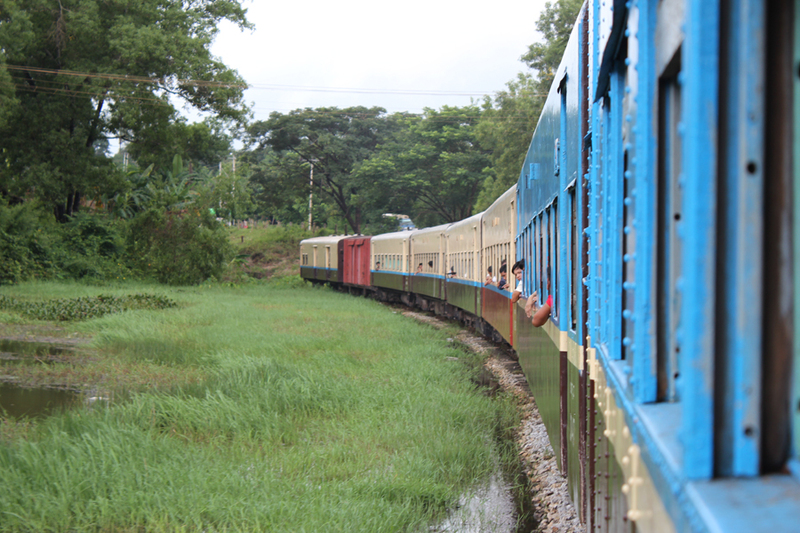 We kept the windows open and the train drove slowly through a lush and green countryside. Enough time to watch water buffalos next to the tracks, kids playing in ponds, women doing laundry in rivers, people preparing their food. Once in a while it got so bumpy that we were thrown out of our seats and had to hold tight. If it had been an airplane rather than a train, I would have had a heart attack. When we arrived, it was raining heavily in Moulemein. It was still raining the next day. And the day after. 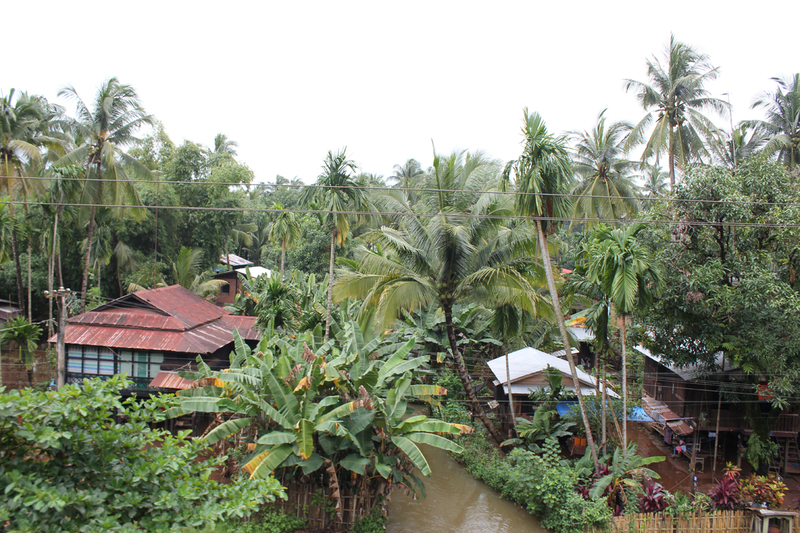 (Only later did I learn that it is one of the rainiest places in all of Burma). At the hotel we asked if there was anything to see in town, and the friendly young woman looked at us, puzzled. “Nothing in particular,” she said. I started to wonder if I had made a mistake. Maybe there was no hidden reason why I felt the urge to go to this rainy place. And then I met Sister Martha. Before we left Yangon, a friend of mine had given me her name and phone number. If I did not have anything else to do, he told me, I should contact her. She was an impressive woman running an orphanage. I called her, and she invited us to her village, about an hour south of the city. We hired a car that drove us to the little town, and a few minutes after we had met her, I knew why I was here. Sister Martha is one of the most impressive people I have ever met: a Catholic nun in her early sixties, gentle, very soft spoken but very determined. There are around twenty kids in her orphanage and they are all HIV positive. Their parents died of AIDS or related illnesses. “When I started out more than ten years ago, people were dying of AIDS but nobody was paying attention,” she recalled. At that time the government had declared that there was no AIDS in the country. Sister Martha asked her order if she could dress like a civilian, but her superior said no. Impossible. But Sister Martha is not the type that takes no for an answer. She wrote a long letter to the pope in Rome and after a while she got a reply: Under these particular circumstances she was allowed to change her dress. She started her organization together with a Buddhist nun to make clear that it was not about religion or a particular faith. It was about humans helping humans in need. Through her hard work and persistence she was able to raise enough money to build three houses for the kids. 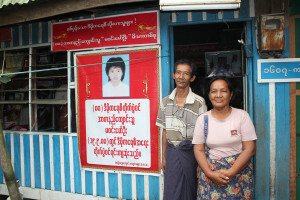 She provides them and more than 50 adults in the village with life-saving medicine, paid for by international donors. “In all these years we haven’t lost one child,” she says proudly. Once I returned to Germany, I started a fundraising drive for a new orphanage further south. 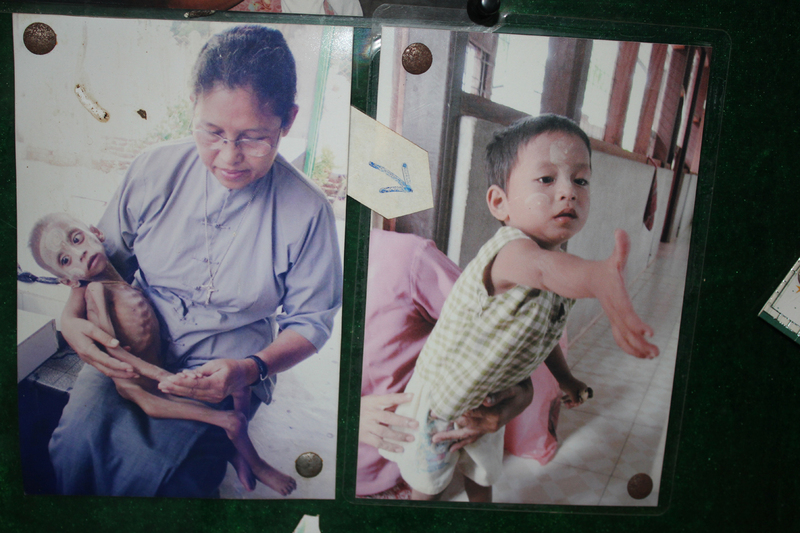 Since then, we have raised more than $25,000 for Sister Martha’s efforts. And the donations keep coming in. Today a Burmese friend took me to the countryside—to be more precise, a suburb of Yangon. It was about an hour drive through heavy traffic, passing several large construction sites. After a while things slowed down, and I noticed familiar sights: kids playing soccer on the streets, people strolling around, tea houses on the sidewalks packed with customers. The streets became narrower, wooden buildings and huts replaced the stone houses, water buffaloes crossed the roads. We took a few turns before ending up in a narrow, dead-end lane. We parked the car and within seconds were surrounded by kids smiling at us, laughing, curious what these strange visitors were up to. My friend and I walked to a small house, and he introduced me to an older couple he wanted me to meet. The husband was a thin, almost frail-looking man in his sixties, but with a very firm, determined voice. His wife invited us inside. The hut was about 200-square feet. There were altogether twenty people living here, the wife told me with a shy smile. The walls were decorated with flowers, Buddhist monks, and photos of the opposition leader Aung San Suu Kyi and her father, the founder of the nation. In the middle hung a very large, almost poster-sized picture of a beautiful but serious-looking teenage girl, one of the couple’s daughters. We sat down. The woman offered us some tea, while her husband brought out another picture of their daughter. It showed a young girl covered in blood, being carried away by two doctors. She was 18 years old when she died, her father explained. Shot and killed by soldiers. One among several thousand unarmed students who were mowed down by government troops in the summer of 1988, because they were demanding an end to military rule. Her parents have been fighting for justice ever since. They have been detained. They have been threatened by the secret police. He noticed my surprised expression and smiled briefly. “You don’t want the people who are responsible for killing your daughter brought to justice?“ I asked. Revenge seemed to be the last thing on their mind. 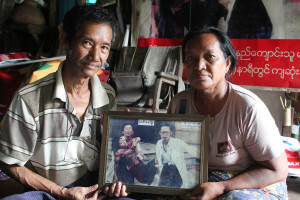 It is one of the fascinating contradictions in today’s Burma that people are allowed to commemorate uprisings and their victims. They are allowed to mourn the killed, but not allowed to ask: who were the killers? Where are they now? When will they be punished? He had a point. But to me it seemed that this couple had learned something more: for them, justice means more than just punishing the guilty. After more than an hour, I left the house deeply impressed by this wise and humble couple. I strolled around downtown Yangon this morning. It was hot and humid but I didn’t mind, I like the heat and humidity of Southeast Asia. People were smiling and returned my greetings just as they always have. The streets were full of tea houses and vendors selling fruits, vegetables, newspapers. I walked into a book shop and could not believe my eyes: on display was the current issue of The Irrawaddy, a monthly political magazine published by Burmese journalists in exile. It is very respected, but highly critical of the military regime, and had been banned in Burma since its foundation in 1993. Not long ago, just being caught with a copy of it could have gotten you sent to jail. Now it was on sale in the heart of Yangon. I bought a copy and checked to see if they even had an office in the city. They did, just two streets away. Luck was on my side. The editor of the English edition, Kyaw Zwa Moe, was in the office and he was kind enough to spend some time with me. Over the next few days, we met a couple of times and he told me his amazing story. He is a mild-mannered, soft-spoken man in his forties, who looks at least ten years younger. 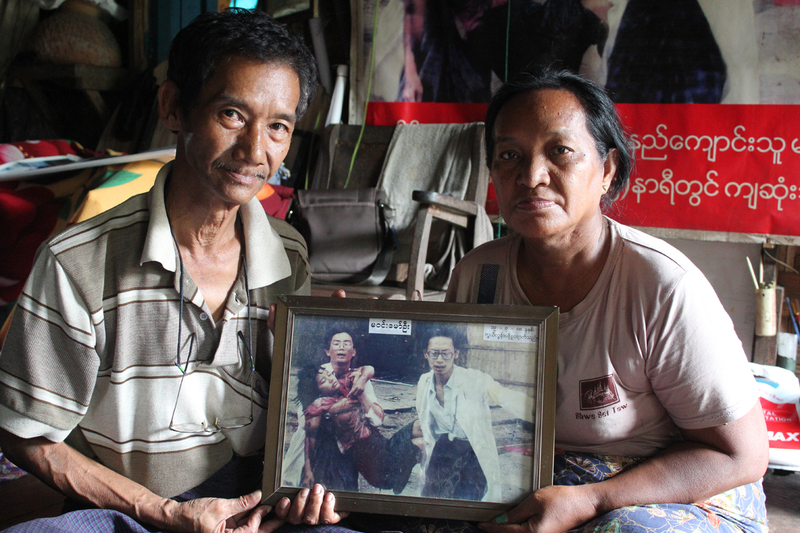 Kyaw Zwa spent eight years in jail as a young student. His crime: he had dared to criticize the government. Life in prison was hell, he told me. Five inmates in a cell eight by eight feet in size. No toilet. Not much food. Visitors were only allowed every two weeks for fifteen minutes. His most frequent visitor was his mother—until the day she was killed in a car accident. After his release, he fled to Thailand. He was then able to study journalism for a year at Berkeley, and went back to Thailand to work for The Irrawaddy. A few months ago he got a visa to live and work in Yangon as a journalist. He is still wary about how long the new freedom will last. “The struggle for democracy has just begun,” he said, happy to be part of it. Until recently the magazine was funded by donations from international donors, but now, it has to become financially independent. Not an easy task. I am back. Traveling to meet old friends, see places I haven’t been to, doing research for another novel. 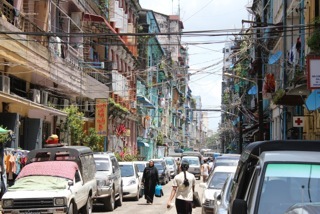 I spent some days in Yangon, walking the streets, sitting in tea houses, talking to strangers and friends. Here are some of my notes, thoughts, questions and observations, from the first few days. It looks like Yangon is changing from a very laid back capitol to a typical Asian even-more-city. Even more cars. Even more traffic jams. Even more construction sites. Even more mobile phones. Had dinner at a nice restaurant. At the table next to me was a group of eight young Burmese, all in their early twenties. They had dinner but nobody was talking. I watched them and it took me a little while to find out why not: Every body was playing with their smart phone. Awkward. I am wondering if it is easier for a Buddhist to forgive since they believe in Karma and reincarnation. Wrongdoers will be punished in the next life. A question I will keep in mind. And then there are place that remain the same. 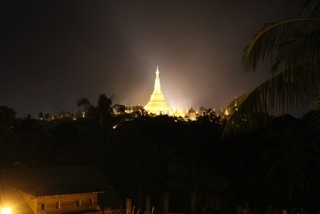 The magical Shwedagon Pagoda, for example. Crowded from sunset to sunrise, people praying, meditating, families eating and chatting, kids playing. Nothing had changed. Or so I thought. I found an ATM machine right on the upper level. And another one. And another one. Why for Buddha’s sake do you need a cash teller right next to the worlds most famous pagoda? Just around the corner I notice a “Free wifi zone.” People are surfing the internet on this holy site, I can’t believe it. What does the Buddha say: Change is life’s law. “There is less corruption?” I asked, surprised.